Malaika Arora and Arjun Kapoor are the newest lovebirds in the tinsel town and it's no longer breaking news. The couple is apparently head over heels in love with each other and a wedding might be on cards for them. Though they deny to speak publicly or acknowledge their relationship, their numerous date nights and some recent confessions are enough to solve our queries. So what happens when either of the partners posts a cryptic message on his/her social media handles? Well, the viewers are compelled to read between the lines here. And Malaika's recent Insta story has enough fodder for your curious minds. Is Good Friday 2019 Stopping Malaika Arora and Arjun Kapoor From Getting Hitched? The Munni of Bollywood took to her Instagram story to share a message about describing one's soulmate. 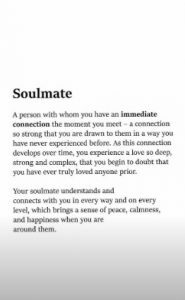 It basically describes who's a soulmate and how instant is your connection with that person. The connection, in fact, is so deeper that you start questioning if you have ever loved truly anyone prior. This does describe her current love life and you can blame us for reading too much between the lines here. And just in case it's a random post that she wanted to share, we hope her soulmate comes looking for her very soon. Koffee With Karan 6: Malaika Arora Finally Confesses on National Television That She LIKES Arjun Kapoor! (Watch Video). Meanwhile, there's a strong buzz about Malaika and Arjun tying the knot this year. Earlier it was reported that they'll have a Christian wedding ceremony and it will be an intimate affair. Though Boney Kapoor had quashed all the stories about his son's marriage, we'd wait for time to answer that.